I offer three birthday party shows, a 30 minute, 60 minute, and 90 minute party package. They are filled with tons of laughter, magic, puppets, juggling, giveaways and wonderful moments of audience participation that you need to have your camera ready for! If you would like something unique for your event, we can create it together! have anything for that age group? Absolutely! 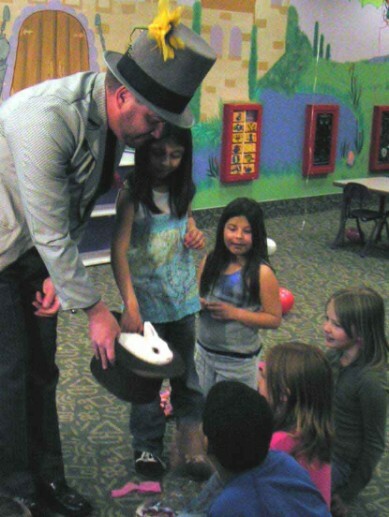 Your magic show should always be tailored to your child and guest's ages. 10 and 12 year olds are totally different than 3 and 4 year olds. Some performers do the same show for all ages. Younger kids love funny slapstick that older kids are insulted by. Be suspicious of any entertainer who does not take into consideration the age of your child, their friends and rest of the audience! For older children we can do a show and magic workshop combo that teaches them tricks that they then take home. I have done this many times and the kids love it! With most birthday party shows, I'm performing right in front of the family room TV or fireplace. I just need a little staging area in front of me for the routines where I have volunteers come forward. Kids should be seated on the floor, don't bother with setting up chairs as little ones get excited and fall out of them! Do you need me to provide a table? Electricity? Anything? Nope. I bring all my own equipment -- sound system if needed, table, everything. Total set up time is about 5 minutes, so we're ready to roll almost as soon as I arrive. My goal is to make this birthday party totally easy for you. In fact, many a mom has told me the show was the best part of the party for them because they were able to relax and enjoy themselves during it! How much are your various birthday party packages? Do you offer any discounts? My birthday party programs start at $250. You can pay with cash or check at the end of the show or prepay with a credit card. If you need a customized package outside the 30-60-90 minute framework, together we will work to create one that works for you. Can you include Goodie Bags? Absolutely! If you don't want to hassle with shopping around, deciding what to include, spending an hour or more stuffing the bags, and then having a bunch of extra gimcracks left over at end, I can provide the goodie bags for your birthday party. I only charge you for the bags you use, so there's no wasted time or money. Please mention you are interested in my supplying goodie bags when you book your show as I need to put them together ahead of time. What's in each Goodie Bag? 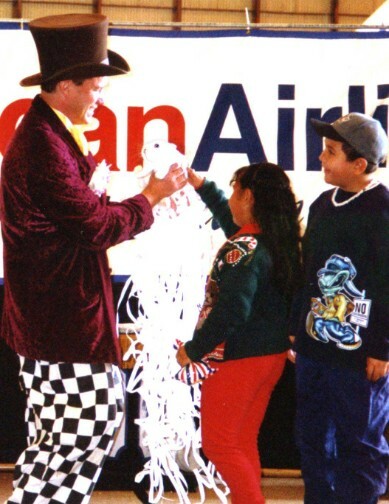 Depending on the children's ages, each goodie bag typically includes items like The Dancing Fish, Multiplying Birthday Candles, Houdini's Nemesis, Optical Illusions and other cool tricks. (I teach magic After School Enrichment classes in elementary schools and have so many way-cool tricks for kids it is hard to decide which to include!) 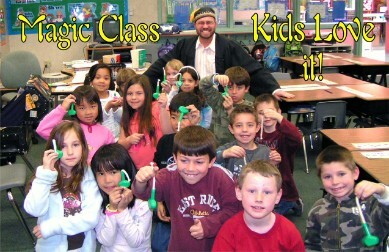 For older kids I can do a magic show and workshop. For them I include tricks that I teach the elementary school kids. My child is scared of clowns. Are you scary? Even though I've been professionally trained in the application of theatrical makeup, I don't wear any -- for exactly that reason. 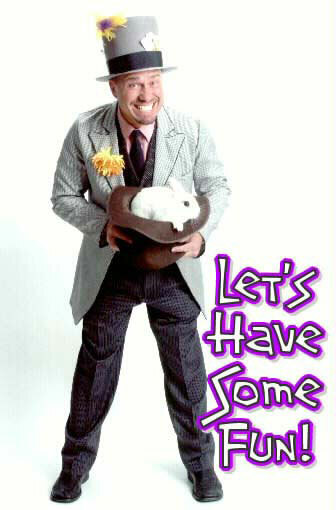 Instead, Hattie will appear at your party dressed in dark slacks, vest and a funny top hat. Safe. Fun. And totally non-scary. How much experience doing children's birthday parties do you have? I have performed professionally for more than 25 years. 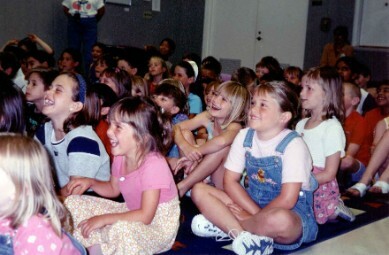 I started doing children shows when I had my two children 20 years ago. Since then I have literally done thousands of shows for families and family events. 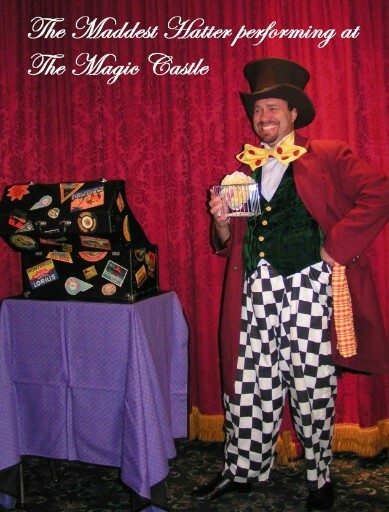 I am a performing member of the Magic Castle in Hollywood, belong to the International Brotherhood of Magicians and the national association of children's performers, KidAbra! Okay Doug, why should I hire you compared to all the other entertainment options available? Have you ever experienced a family celebration where every child, every family member, every friend sat transfixed with their eyes glued wide open? Where everyone's jaws just flat out dropped in amazement? Where the walls of the room seemed to practically rock with howls of laughter and fun? 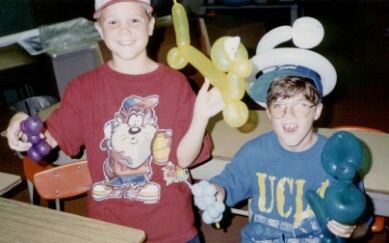 If not, then you've never had the pleasure of experiencing one of my birthday party shows. And every one of my birthday party programs is 100% -- "no worries, no hassles, no way you're not going to be thrilled" -- money-back guarantee. There's absolutely zero risk to you. Your family will get a totally unforgettable birthday party magical variety show packed with laughter, wonder, and incredible Kodak moments guaranteed to create memories that will last a lifetime. But aren't all birthday magicians and clowns the same? Why shouldn't I just keep calling until I find the cheapest entertainer? If getting the cheapest price is your top priority, you should definitely shop around. I do not promote myself as one of the cheapest around, just one of the best. 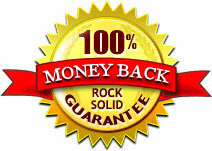 That is why I have a 100% Money Back Guarantee. You need to find someone you are comfortable inviting into your home and are willing to share with your family. There is a difference between "price" and "value" -- a weekend warrior who puts on a sponge nose, buys a couple magic tricks, and hires themselves out a few times a month and promotes themselves "For All Occasions" will probably not cost very much. I charged less when I was starting out too. On the other hand, if inviting a trained professional into your home to create an unbelievably enjoyable experience you can confidently share with your family and friends and involves a totally different level of value then please call and let's talk! Weekends especially fill up fast. To reserve your space, contact me today. What is the date or your event? Anything else you would like to add before I get back to you??? Dad says Doug was a lot of fun! Happy kids having a great time is what it's all about! Dad says his girls were laughing the whole time! Kids learning magic tricks, they do love it! Doug and the birthday boy or girl magically produce the bunny rabbit together! Goodie Bags: I will not be including this type of helicopter toy in my goodie bags. 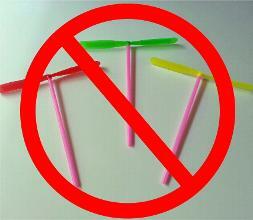 They are too dangerous for children and even adults as the spinning blades can cut skin or scratch corneas! 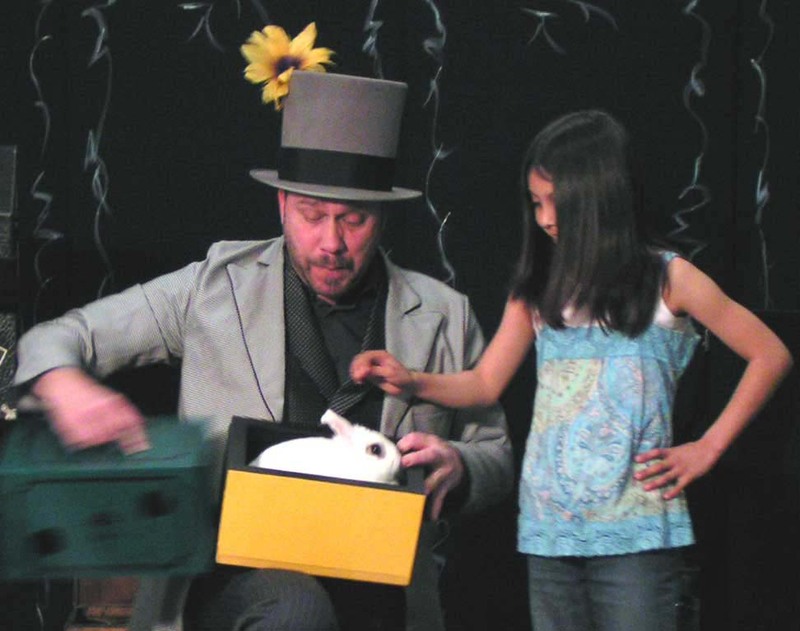 All the kids pet the rabbit after he magically appears! Would you like this much fun at your party? Looking For A Magician, Clown Or Entertainer In Your Area?